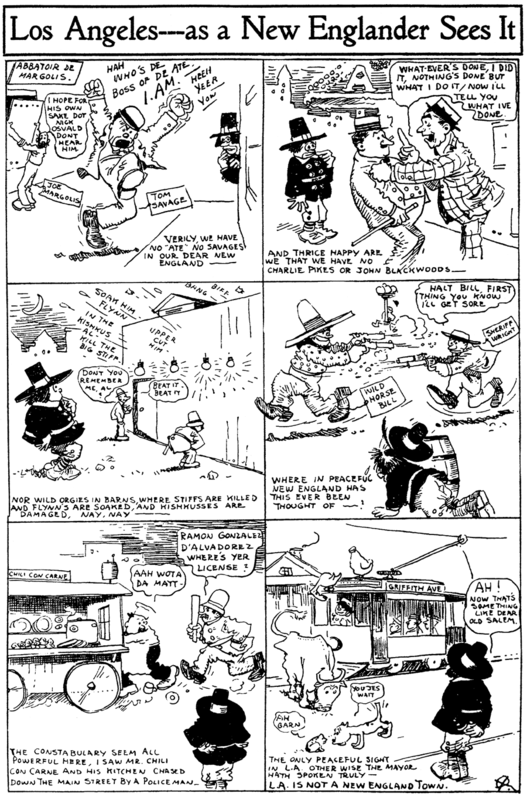 Wednesday, August 26 1908 -- Apparently the mayor has commented that LA is not a New England town; Herriman illustrates some of the ways in which they differ. Oh, cool! I've always wondered how they put ski attachments onto a plane. So, uh, that's, um, how they do it. I see. Hmm. Connie, May 2 1937, courtesy of Cole Johnson. 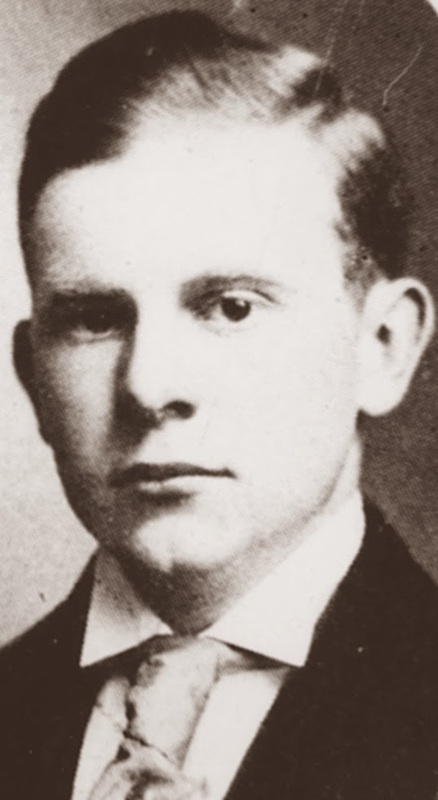 William Ogg FitzGerald was born in Michigan on October 10, 1884. His birthplace was recorded in the censuses, and the birth date and full name was found on his World War I draft card. In the 1900 U.S. Federal Census, FitzGerald was the second of two children born to Lucius, a physician, and Elizabeth, both emigrants; his father was Canadian and his mother Scottish. They resided in Oliver, Michigan. Information regarding FitzGerald’s education and art training has not been found. FitzGerald and his mother, a divorcee, lived in Detroit, Michigan at 105 Stanley Avenue. His occupation was cartoonist. A single sentence in Cartoons Magazine, March 1916, noted FitzGerald’s whereabouts: “W.O. Fitzgerald has been engaged as staff cartoonist on Dome Echoes, a San Francisco publication.” A 1917 San Francisco city directory listed FitzGerald as an artist at 1144 Market Street. According to the 1920 census, FitzGerald remained in Royal Oak with his wife and daughter. He continued his job as a manager at a newspaper. 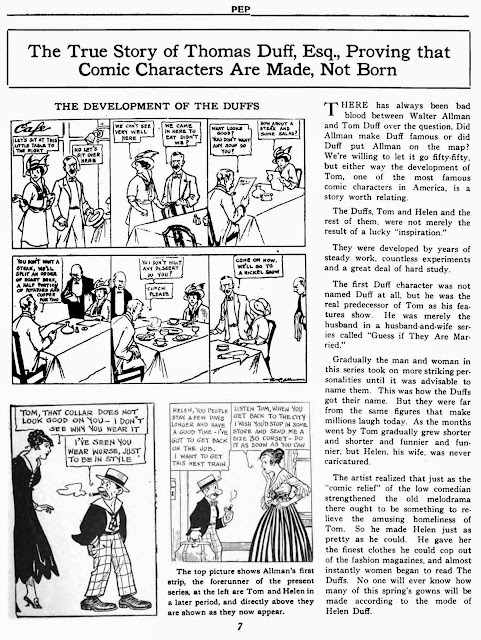 Readers of various daily papers which for several years contained the comic strip, “Doings of the Duffs” will learn with pleasure that although Mr. W.R. Allman, the originator, will never again draw a line, Mr. W.O. Fitzgerald of Detroit has made an intense study study of it for the past many weeks and has taken it up right where Allman left it. And now the Duffs are appearing in the Muscatine Journal and in other daily papers and thousands of readers are again reading their humorous lines. Our Artist ExhibitsBeginning April 12 William Ogg FitzGerald, with whose illustrations all our readers are familiar, will place an exhibition of his drawings on display for one month in the art gallery on the mezzanine floor of the Bonstelle Playhouse. 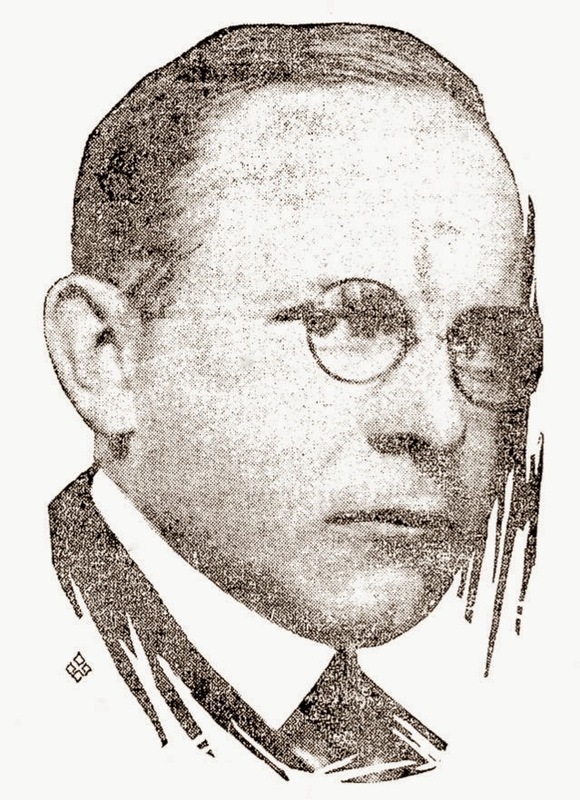 In the mid-1920s, the Dearborn Independent published FitzGerald’s work. Historical Detroit (1926) was the story of early Detroit as told by twenty bronze tablets. FitzGerald’s artwork was acknowledged. FitzGerald was the father of four children in the 1930 census. The family still lived in Royal Oak but at a different address, 1074 Harwood Avenue. He was a commercial artist. One of his projects was illustrating a set of plates about Detroit and Michigan. They were manufactured in England. In this company’s booth is a series of poster murals depicting the uses of steel, and a large painting giving a conception of the future of transportation, the work of William Ogg FitzGerald, Detroit artist. 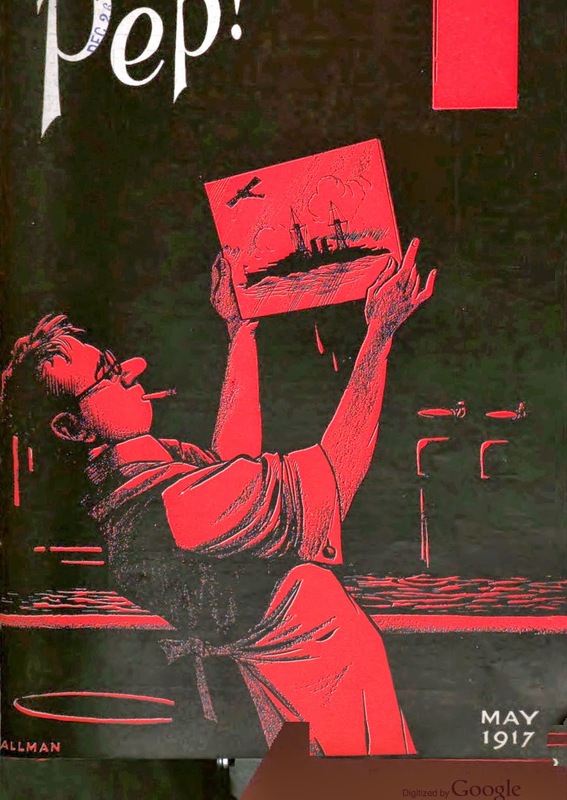 FitzGerald illustrated the 1934 book, The Way Out: A Common Sense Solution to Our Economic Problems. Spring seems to draw Detroiters to New York. Mrs. William Ogg Fitzgerald has been flitting about the city recently, visiting her husband who is now on the staff of the Wall Street Journal and Barron's Weekly…. Old Banking Landmarks of New York was illustrated by FitzGerald and published by Barron’s in 1936. In 1940, FitzGerald resided in Mamaroneck, New York at 24 Barnum Road. He was a newspaper artist. The Union Sun & Journal (Lockport New York), October 2, 1948, reported the wedding of FitzGerald’s oldest son. At the time, FitzGerald lived in Larchmont, New York. FitzGerald passed away July 1967, in New York, according to the Social Security Death Index. His last residence was in Larchmont. An obituary has not been found. 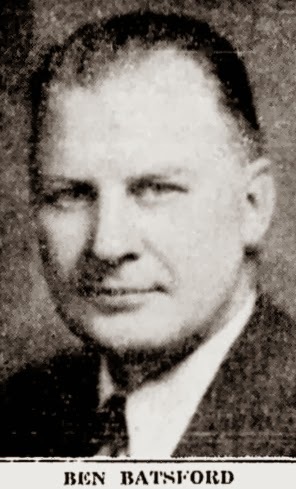 Walter Reese Allman was born in Toledo, Ohio. His obituary said he was 42 years old at the time of his death in 1924, which made his birth year 1882. However, his World War I draft card has the birth date February 27, 1884. At some point during his childhood, Allman’s mother, Mary, remarried. The 1900 U.S. Federal Census listed him as “Allman Krumling” and his birth as “Feb 1884.” He resided in Toledo at 2439 Vermont. His step-father, Frederick, was a telegrapher. In the 1910 census his name was recorded as “Walter Krumling”. His family remained in Toledo but at a different address, 115 Columbia Street. The Muskegon Chronicle (Michigan), September 8, 1917, published the story of Allman’s start in cartooning. Boys were setting up quotations in grain and other produce on the board in a Toledo grain broker’s office back in 1902, when a man named Clark strolled in. Clark had come from Chicago and being editor of the Grain Dealers’ Journal, had business in this office. He noticed a box at the side of the board on which was a sketch of a man’s head an artistic clerk, in his leisure moments, had penciled. 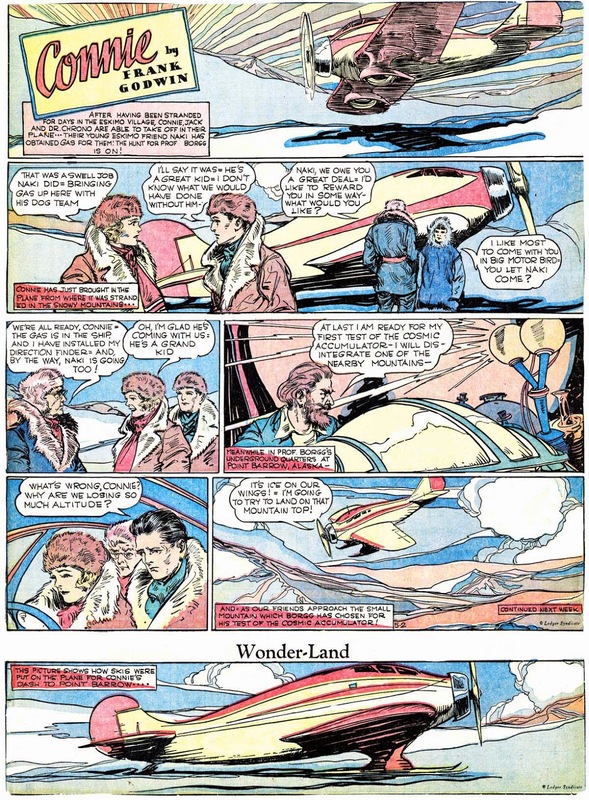 Struck by the originality of the drawing, Clark immediately “drafted” the perpetrator, and that is how Walter R. Allman, originator of the Duffs for the Chronicle, started on his career toward fame in the comic art world. Allman was 18 years of age at the time and all the drawing he had then had been born with him. He worked one month for Clark in Chicago, after which he shifted about from place to place, working at anything in the art line until in 1905, he went to the Toledo News-Bee as local cartoonist…. Mr. Allman was cartoonist and artist on The News-Bee for 10 years. Shortly after leaving high school he took a job with a Toledo grain company. While there he practiced for his future work by drawing on the sides of boxes and crates. Later he went to the Franklin Printing and Engraving Co. and then came to The News-Bee. His work received special recognition and he was appointed to the NEA Service staff of artists on May 16, 1914. Mr. and Mrs. Allman had resided in Cleveland since that time. They lived at 11843 Lake av. A number of city directories at Ancestry.com tracked Allman’s whereabouts and occupations. The 1903 Toledo city directory listing said: “Allman, Walter R, clk [clerk] Reynolds Bros, bds [boards] 2439 Vermont av.” The 1905 directory said he had moved to Chicago. In 1906 Allman was in Toledo at 115 Columbia Street, and an artist at the Franklin Printing & Engraving Company. He remained at the same address in the 1911 directory which had his occupation as cartoonist at the Toledo Newspaper Company. 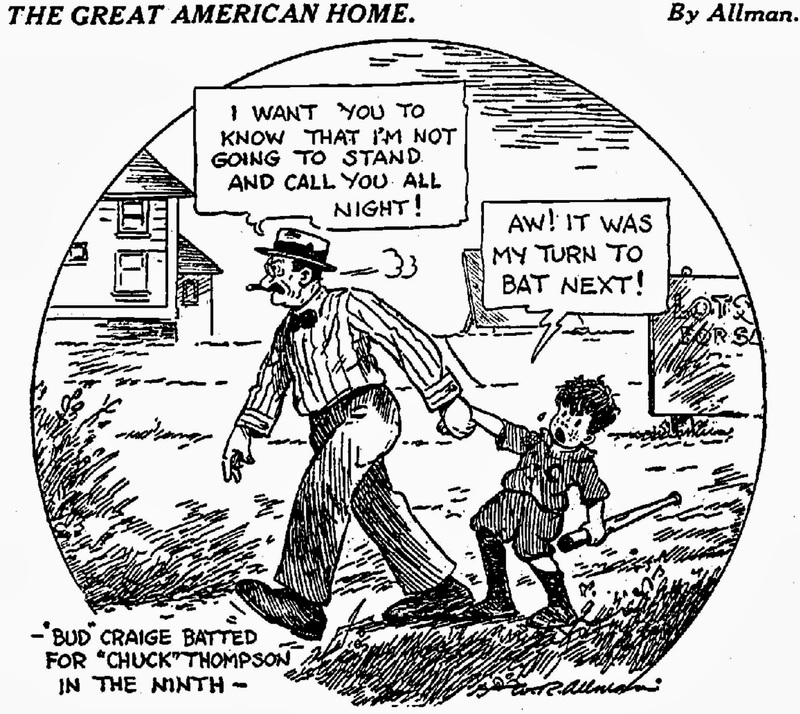 The 1916 Cleveland city directory listed Allman as a cartoonist residing at 8012 Carnegie Avenue. On September 12, 1918, Allman signed his World War I draft card. His address was the same as the Cleveland directory listing and he was a cartoonist for Newspaper Enterprise Association (NEA). 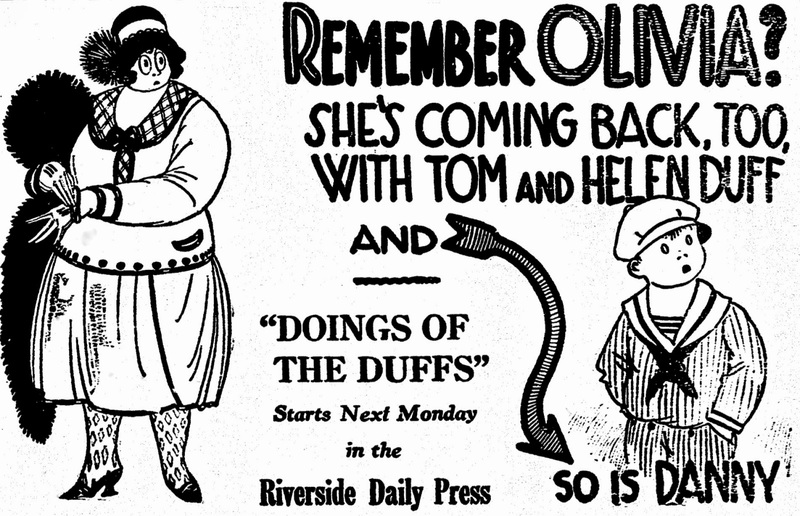 For years the Duff family cartoon appearing on the comic page of The News-Bee had endeared itself to thousands of readers in Toledo alone. This cartoon also appeared daily in hundreds of other newspapers thruout the country. The Duff family as portrayed by Mr. Allman was “regular” family life. Hundreds of Duff fans have called The News-Bee to inquire why the strip had been discontinued. They were told of Mr. Allman’s illness. Allman’s other comics were “Dreamsticks”, “The Great American Home”, “Honest, This Is How it Happened”, and “They All Fall for It”. In the 1920 census Allman and his wife, Theresa, lived in Cleveland at 2959 Coleridge Road. The News-Bee said he married Theresa Reardon in Toledo shortly before they moved. Allman was an artist who worked at an office. 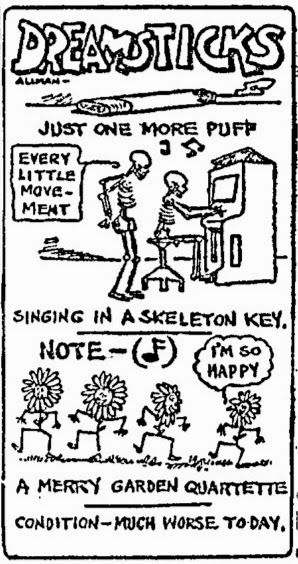 His neighbor, at 2933, was 25 year-old cartoonist, Roy Grove, who lived with his parents. A 1923 Cleveland directory said Allman resided at 2970 East 83rd Street and worked for NEA. Walter R. Allman, 42, noted News-Bee cartoonist, creator of the Duff family, died on Tuesday at 8:15 a.m. in St. John’s Hospital, Cleveland. Death followed a nervous breakdown. Mr. Allman had been ill for more than a year. The body will be brought to Toledo on Thursday morning for burial. Services will be held in the Couldwell Funeral Parlors. His mother, Mrs. Mary A Crumling [sic] of Toledo, and his widow, Mrs. Theresa Reardon Allman, former Toledo girl, survive…. 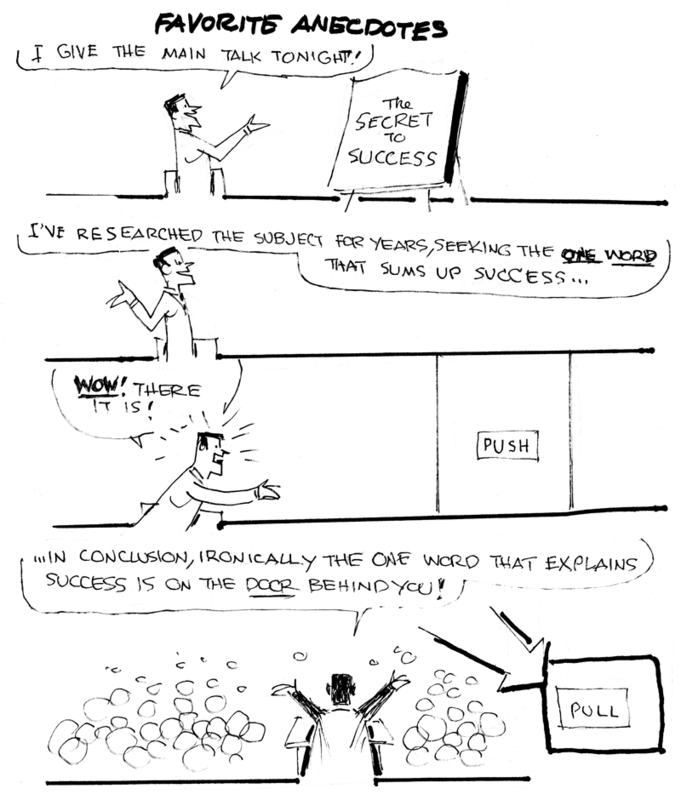 ...Last winter the cartoonist suffered a nervous breakdown. Accompanied by Mrs. Allman, he went to Miami, Fla., to regain his health. In February he returned to Cleveland. Shortly after he was taken to the hospital where he died Tuesday. 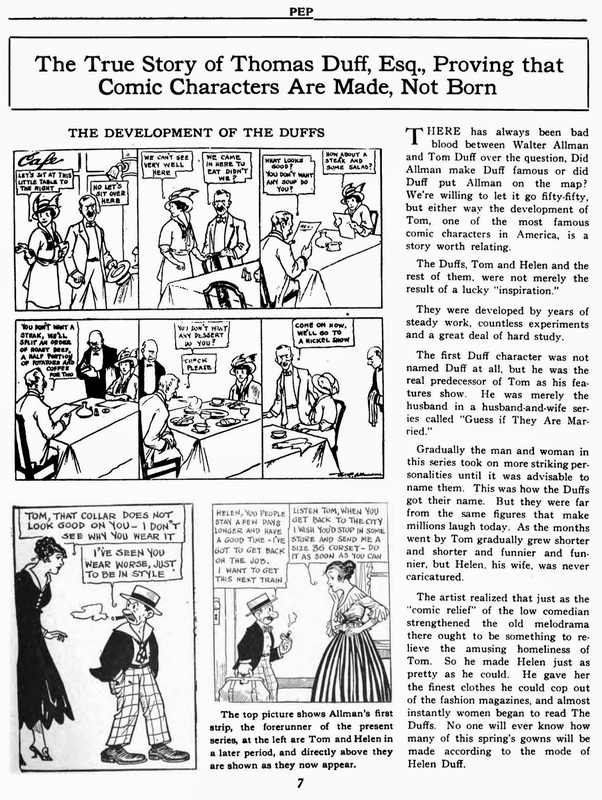 American Newspaper Comics said Doings of the Duffs resumed with W.O. Fitzgerald on January 30, 1925. He was followed by Ben Batsford, June 8, 1925, and Buford Tune, July 23, 1928. 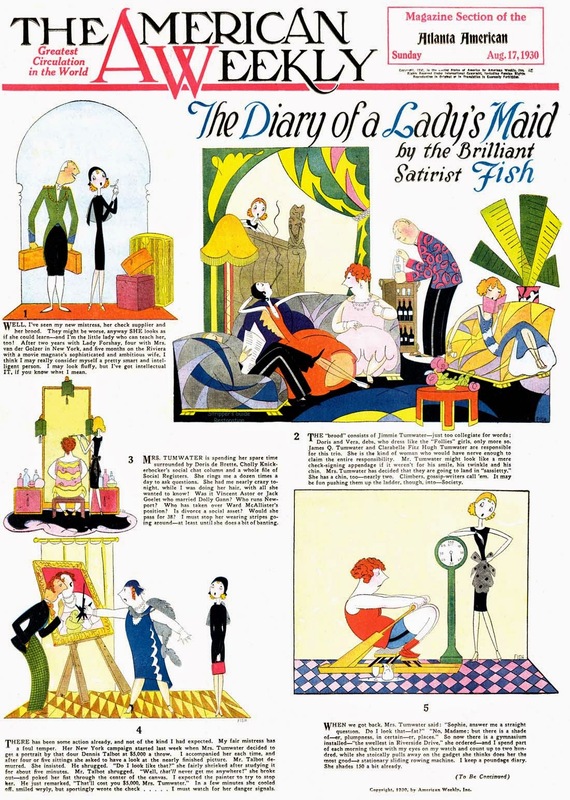 Here's a second look at Fish's The Diary of a Lady's Maid, which we previously covered in this post. Why are we revisiting it? Well, I could tell you that it is such a great series that I decided to restore another example. While it is in fact a darn fine series, the truth is that I restored a second example this morning because I was hurriedly casting about for a post to do, and didn't realize that I'd already covered this series. I made that mistake because, despite what I hope looks like a smoothly running blog from your perspective, all hell has broken loose behind the scenes. You see, I just returned from a three week trip out of the country. Before leaving, I prepared a month's worth of posts. Three weeks worth for when I would be out of touch, and an extra week's worth to give me time to settle back in on my return. It seemed like a foolproof plan (me being the fool in question). Unfortunately, when I returned to Casa Holtz, it was to find that my computer had decided that, having been unplugged and on vacation for three weeks, that the rest was insufficient. So the hard drive crashed. Then to add insult to injury, my meticulously careful backups did not work quite as expected, leaving me after several days of swapping drives and backups, with an incomplete restoration with which I am still wrestling*. Add to that a head cold courtesy of my fellow airplane passengers, and a variety of other non-comics related emergencies around the homestead, and the week of posts that I arranged for ran out entirely too quickly. Now that you understand that the Stripper's Guide universe is in a temporary shambles, and are no doubt shedding warm empathetic tears on my behalf (you are, aren't you? ), here's what I'm gonna do to try and get this train back on the track. Alex Jay has had a group of fine posts in the queue for a long while now, all waiting for me to write complementary posts. Well, those complementary posts ain't gonna happen any time soon, so we're going to unleash Jay's work on you without the questionable benefit of my own blather to go along with them. 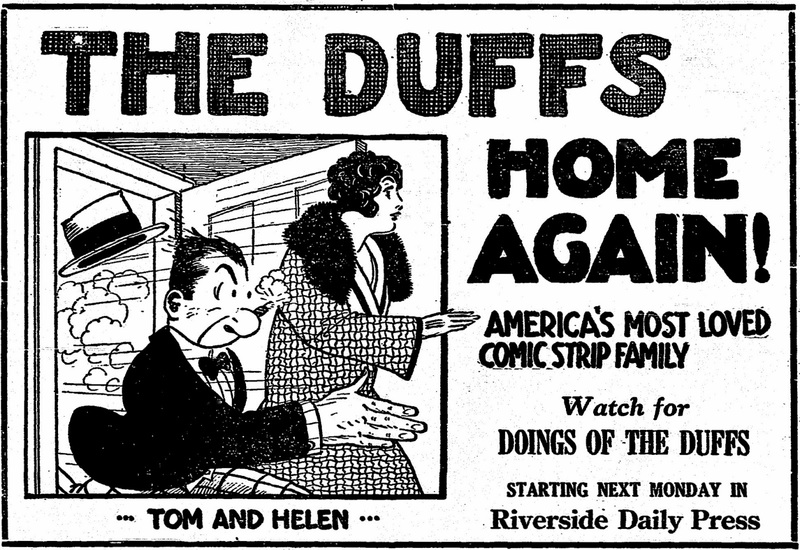 First we'll have profiles of the cartoonists that worked on one of the first 'family sitcom' strips, Doings of the Duffs. After that we may continue with a group of posts about Dr. Guy Bennett, which has been sitting in the queue because I could not come up with even a short run of strips to run in an accompanying Obscurity of the Day. Hopefully by then I'll be able to patch my world back together. Enjoy! * By the way, I lost the last month's worth of emails in the process. So if I haven't responded to a query that you sent in September-October, try sending it again please. Wonderful stuff! I note a title The First Book of Eve by Fish (on ABEbooks) ... humor from 1916/comic strips it says.... I have not seen it.... and a couple other titles she did decorations for. On Amazon there is a Third Eve Book, so this was perhaps a strip of hers. As the book intro says, these 'strips' originally appeared in the British publication The Tatler. Too bad the color sundays of 'all' of the comics aren't available.....preferably in hard copy. Thankyou for presenting them like this!